RIYADH, 4 November 2003 — The Prince Salman Center for Disability Research (PSCDR) is conducting a pioneering research project on “Speech and Language Development in Saudi Children,” said Waleed Al-Deaigy, director of public relations and media affairs at PSCDR. Dr. Heidi Alaskary, Dr. Abdul Rahman Al-Akeel, Dr. Sadi Al-Zahrani, Suzanne Al-Ghanem and Dr. Muhammad Bakalla are conducting the research. Dr. Alaskary, the coordinator of the project, told Arab News the primary aim of the research was to “establish normal data or patterns of speech for children between the ages of one and eight years” against which speech development can be measured. She said children often presented with severe delays in speech development, such as eight-year-olds who can say only two words, although parents are becoming more aware and having their children examined at an early age. The program could take up to five years, Dr. Alaskary said. One of the problems it faces is that there are many dialects in the Kingdom and hence the team will need to study different regions. They are currently studying the dialects of two regions, Riyadh and Jeddah, and will then go on to study three other dialects. There are 16 groups for each region and 100 children in each group, which makes research very time-consuming. Analysis is carried out on the LIPP program, adapted for Arabic speakers by Dr. Mousa Amayreh, speech language pathologist from Jordan, and Dr. Alice Dyson. “The LIPP program allows you to put in a word on the computer and see how the child says it phonetically, and then it tells you what was correct and incorrect,” Dr. Alaskary said. She added that there are other measures such as natural language sampling where representative samples of child language are elicited by means of interacting with peers or parents. This allows the researcher to study whether they are using masculine or feminine forms, verbs, negatives, exclamations, and so forth. Everything the child says must be written down. It is computerized in English but unfortunately not in Arabic. According to Dr. Al-Askary, no previous study has been done on such a large scale. “We hope to produce a standardized questionnaire that can be used by pediatricians, teachers and speech language pathologists,” she said. She said that if a child has a language disorder and is seen before the age of five, the chances of developing normal or near-normal language are very high. But the older the child, the more its chances decrease. Thus early testing is essential. 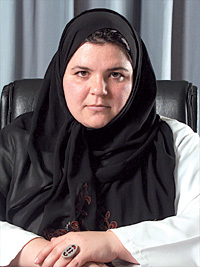 Dr. Alaskary stressed that in order to continue this research and other projects being conducted at the center, it is important that private institutes and individuals participate by supporting the PSCDR in order to achieve proper treatment, diagnosis, and early intervention, as well as to improve the lives of the disabled and their families. Those interested can contact PSCDR Tel: 966-1-488-4401 Ext. 26/38 or visit the website: www.pscdr.org.sa.